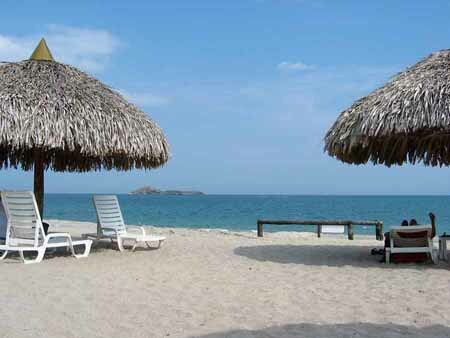 ROYAL DECAMERON PANAMA—It’s a tough life, writing about hotels in Panama. Being pampered each day, eating choice food, suffering superb service, meeting interesting people. Everybody’s life should be so tough! There are some real drawbacks, though. Traveling between various hotels in Panama, my office is in my suitcase, and it moves every day. The stories have to be written daily, too. There are so many interviews, so many details, and I am afraid that if I don’t get it all down on paper quickly I might confuse an interview done in one hotel with someone in a completely different hotel. Unlike other hotels in Panama, my office today has no plug for a computer – in fact, no computer. Knee, pad and pencil only. Back to the Dark Ages! It’s noisy, too. There’s the muffled rumble of the Pacific Ocean on a white sand beach. Birds cheep and trill in the trees behind me. There’s a Caribbean beat emanating quietly from a nearby beach bar. For furniture, my office is equipped with a lounge chair under a palapa with a thatched roof some 12 feet wide. Supported by a single central pole, it’s a bit like a rustic umbrella. A hard life, indeed! 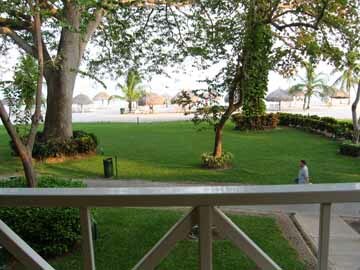 The view from my spacious balcony at the Royal Decameron Panama, looking toward "the office". Today, in search of the finest hotels in Panama, I’m at the Royal Decameron Panama Resort, and one day is not nearly enough to experience even a fraction of the available activities. A second couple has just passed in front of the beach in one of the resort’s yellow kayaks. For me, that experience will have to wait until next time, as will my opportunity to go horseback riding…something I have not done in more than 50 years. But I will go for a swim before the afternoon is done. There are enough activities to keep vacationers busy for as long as they wish, including a jungle boat tour, a visit to an Emberá indigenous community, bird watching, fishing, diving, river rafting and a dozen others. You can even combine your stay with one of the other hotels in Panama and go on a shopping expedition in Panama City. Or, more sensibly in the view of one who hates shopping, just laze back on a lounge chair with a book, as many guests nearby are doing. Now and then, someone strolls to the beach bar (there are seven bars in the 600-room resort) and returns with drinks. They are free, as is the food. Even, to the dismay of some, the cigarettes are free. To ward off nighttime hunger pangs, no doubt. It’s possible to eat at the Royal Decameron Panama from 6 a.m. until 2 a.m. There are six specialty restaurants. Four serve regional fare – Italian, Thai, Mediterranean and Japanese – one specializes in seafood and another in grilled dishes. There’s also a theme buffet restaurant, two snack grills and a pizzeria. 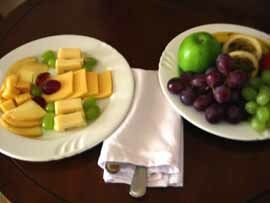 And if you’re still hungry in the night, a large plate with four kinds of cheese, and another piled high with fresh fruit, was delivered to my room some time during the afternoon. To work off some of the calories, there are seven pools, a well-equipped gym, a tennis court, areas for soccer and beach volleyball, horseback riding, a discotheque and a championship golf course that will be part of the PGA tour in 2006. There are pedal boats and sailboats, snorkeling and an introductory SCUBA diving course, and a wind glider, too. (I’ll have to try that next time. That should be good for a laugh, given my poor sense of balance!) There are daily aqua-aerobics and dancing lessons in two of the pools, and there's a spa. For those who have energy left, there’s a show early in the evening in the amphitheatre for youngsters, and later in the evening there’s another show for adults, all staged by a group of dancers and singers employed by the Royal Decameron Panama hotel. It’s a fun night, and I understand the show is different every night. The show I attended was a hoot as guests were put through strange antics that brought gales of laughter from themselves and the audience. The Royal Decameron Panama is one of the most popular hotels here, and it’s easy to see why. Some 50% of its guests are Canadians who take packaged tours out of Montreal and Toronto. There are no packaged tours from the U.S., although some 10% of guests are from that country. There was not time to meet the executive chef this time. That will have to wait for my next visit…and I can hardly wait! Price? The question is: how do they do it so cheaply? If you want time away from it all, this is certainly one of the hotels in Panama that you should consider.